Hello ... Hello ... my old friends ... It's great to see you once again! 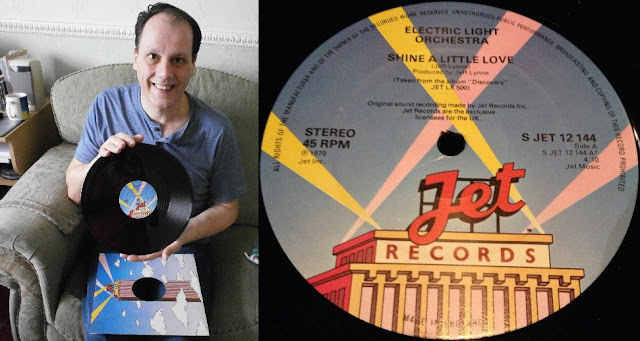 Back (or should that be 'black') in October 2014, elobeatlesforever (elobf) published this article wherein I recalled my search for the elusive 12" black vinyl issue of ELO's "Shine A Little Love" b/w "Jungle" (Jet/CBS SJET12144) and, sadly, the "Time" when a copy of said rarity was forcibly pushed through my letterbox and tragically broken in half whilst I was away on holiday. This record is one of those collectors items where the coloured (white) vinyl edition was much more numerous than the black and Yours Truly KJS has been searching for another copy both online and at record fairs. I'm pleased to announce, as you can see from the photographs contained within this article, that search is now over as an intact black vinyl copy of "Shine A Little Love" b/w "Jungle" (Jet/CBS SJET12144) arrived at elobf HQ in Wolverhampton earlier today (Saturday 29th October). I've said this before, but being a fan of ELO and a collector is sometimes a frustrating experience but always rewarding as an interest and a hobby. I would like to thank those wonderful friends and fellow ELOnoraks who have been looking out for another black vinyl copy of SJET12144 for me and/or those wonderful souls who have accompanied my fruitless searches at certain record fairs (i.e. John Collins).